Whether it was love at first sight or a special moment that solidified your bond, your hearts are linked together forever! 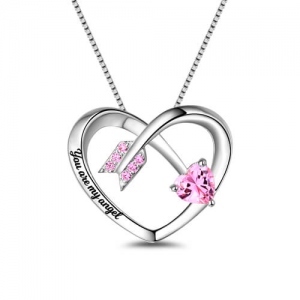 Now, celebrate the first moment of your love with the Love Arrow Heart Pendant Necklace. Customized with a shining heart-shaped crystal birthstones and engraved sweet words: you are my angel, this stunning pendant necklace is a one-of-a-kind expression of your love!This heart-shaped crystal birthstones Necklace special designed like two heart twining. On the heart centre contacted with the love arrow, representing the couple's love. It is exquisite handwork and made of 100% 925 sterling silver. It arrives in a gift box, perfect for safekeeping and gift giving. Strong demand is anticipated for this personalized pendant necklace, so don't delay. Order now!